Owner of the Izbenka chain, Andrey Krivenko, has become Russia's largest vendor of fresh milk in just three years. After having trouble finding a job during the 2008 financial crisis, Krivenko decided to start his own business: Izbenka now collects over $30,000 in monthly revenue, with virtually no assets. On the Izbenka website forum, user Andrey Krivenko is certainly the most emotional, if not the most active. He was once accused by a visitor to the site of praising his chain’s entire line of products, despite having almost certainly never tried them. In response, Krivenko immediately posted a photo of his own refrigerator filled with Izbenka dairy products; the 37-year-old businessman has four children, so milk is a permanent fixture on the menu. It took Krivenko just three years to turn Izbenka into Russia's largest seller of fresh dairy produce. As of September 2012, the chain consisted of 140 outlets in Moscow and Moscow Region. Secret Firmy magazine estimates that each of these outlets rakes in more than $30,000 per month in revenue. If this is the case, then the company’s annual net turnover is in excess of 1.7 billion rubles ($57 million). During the crisis of 2008, Krivenko resigned as chief financial officer of Agama Trade (a major distributor of fish and seafood) and later found himself unable to find work. He fired off his resume to dozens of companies, but to no avail. Meanwhile, his $30,000 of personal savings was being eroded by monthly mortgage payments of $3,000. Desperate to find a job, he eventually decided to set up his own business, making products with no added preservatives or flavor enhancers and selling them from proprietary stalls inside supermarkets. Krivenko's first step was to recruit dairy technologist Dmitri Kozyrev. Andrey could only pay $800 a month, but he managed to persuade Dmitri that the business would soon take off. Together they went in search of suppliers, but finding them proved far from easy. Large producers around Moscow made dairy products mainly from milk powder, and no one wanted to overhaul their technology for the sake of one purchaser. "They looked at us as if we were idiots," says Andrey. After visiting 50 processors, he finally found his first supplier — SAPK-Moloko, a small plant in the village of Zherdev in the Kaluga region. Izbenka was in luck: The plant had just opened a new production shop and was actively seeking sales channels. Krivenko not only received products of the right quality, but he also managed to arrange a payment deferral. The venture got underway at minimal cost: the lease for his first outlet, which was no bigger than 53 square feet in Moscow’s Troitsky mall, cost him $530 a month; the purchase of a commercial refrigerator set him back $650. The first Izbenka had an assortment of just six products made by SAPK-Moloko. Employees at the plant affixed "Izbenka" labels by hand; only later did Krivenko start buying packaging with the company logo applied typographically. Andrey handled the logistics himself: he would be up at three in the morning, at the dairy plant by six, and at the unloading site by nine. Andrey spent his afternoons looking for new premises and writing software to manage trade flows, based on the 1C suite. In the space of three months, Krivenko opened another three outlets; but two of them made huge losses, which almost put an end to the entire enterprise. It turned out that Andrey's choice of location at markets proved to be a mistake. He had counted on a large flow of customers, but market shoppers were more interested in bargain deals. At $1.5 per liter, Izbenka milk was more expensive than the ubiquitous TV brands and other lesser-known varieties. Having had his fingers burned by a mortgage, Krivenko now steers clear of bank loans. Therefore, the company invests in its own development. The model works, provided the costs of opening a new retail-point are small and it turns a profit very quickly. Krivenko spent just $3,000–5,000 to set up each of the first Izbenka outlets. The cost has since risen to around $10,000 per outlet, as the average area has increased from 53 square feet to 107 square feet. Andrey Krivenko's business is almost entirely free of assets: All premises are leased and all transport is outsourced. Everything is underpinned by the cash flow, which is growing steadily. "What's the point of buying a warehouse, for example? To use as collateral for a bank loan to build another? No, thanks," says Krivenko. On the other hand, such a strategy is like riding a bicycle: if you slow down, you fall off. Izbenka feeds off money from suppliers, which it reinvests in new outlets. A slump in sales could cause a cash gap; and the company would not be eligible for a bank loan, because it has no assets to pledge. 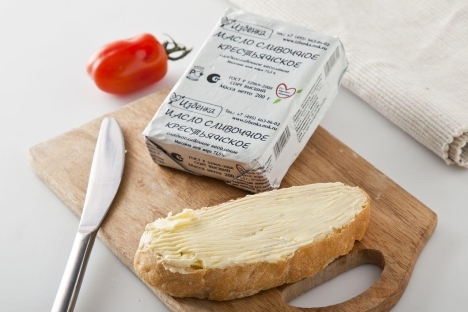 For that reason, Krivenko started a new business venture: Vkusvill (meaning “Flavorville” in English) is a chain of shops that sells not only dairy products but other foods made with no added preservatives, flavor enhancers, etc. Andrey plans to open more than 200 stores over the next 2-3 years. First published in Russian in Secret Firmy magazine.